Singtel store in Raffles City Mall in Singapore; taken August 2018. Singtel reported on Thursday that its net profit for the fiscal second quarter fell 76.6 percent on-year to S$667 million amid a gain in the year-ago quarter from selling NetLink NBN shares and amid headwinds from a stronger Singapore dollar. That missed an analyst forecast. UOB KayHian had forecast second quarter net profit of S$747 million. “The group’s results for the quarter were adversely impacted by negative currency movements and various headwinds, including lower NBN migration revenues in Australia, decline in voice revenues and lower associates’ contributions from Airtel and Telkomsel on intense competition,” Singtel said in the statement. Underlying net profit fell 21.8 percent on-year to S$715 million, with a 4 percentage point hit from the strong Singapore dollar, Singtel said in a filing to SGX before the market open on Thursday. Operating revenue for the quarter was nearly flat on-year at S$4.27 billion, compared with S$4.268 billion in the year-ago period, it said, but noted it would have grown 3.9 percent on-year in constant-currency terms. Earnings before interest, tax, depreciation and amortization (EBITDA) fell 9.6 percent on-year to S$1.13 billion, with the EBITDA margin falling to 26.4 percent from 29.3 percent, Singtel said. Singtel declared a dividend of 6.8 Singapore cents in the quarter, it said. For the fiscal first half, Singtel reported net profit fell 60 percent on-year to S$1.50 billion, while operating revenue slipped 0.2 percent on-year to S$8.40 billion. “Our industry continued to face various headwinds and intense competition. Notwithstanding these challenges, the half-year results reflect the resilience of our business with continued focus on networks, differentiated content, unique capabilities and innovative plans,” Chua Sock Koong, Singtel CEO, said in the statement. “We continued to add postpaid mobile customers across both Singapore and Australia and improved our customer retention rate,” she added. Its share of associates’ pre-tax profit halved on-year to S$330 million from S$659 million in the year-ago quarter, mainly due to Airtel and Telkomsel, it said. “Airtel recorded weaker earnings adversely impacted by lower domestic and international mobile termination rates and sustained pricing pressure in India, partially mitigated by improved performance in Africa,” Singtel said. “Telkomsel’s lower earnings were due to steep decline in voice and SMS revenues partially mitigated by higher data and digital revenues. Compared to the preceding quarter, however, Telkomsel’s profit contribution improved by 22 percent on data price increases in selected regions,” it added. Singtel’s CEO Chua remained positive on the company’s associates outlook, saying they continue to benefit from growing data demand. “Our recent investment into Airtel Africa together with other global investors show confidence in the long-term growth potential of the continent with smartphone penetration and adoption of mobile payments set to rise even further,” she added. 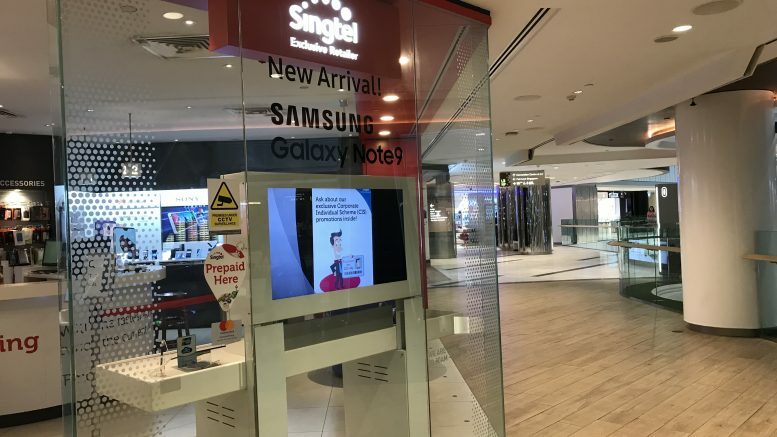 The group consumer segment reported operating revenue for the quarter rose 1.5 percent on-year to S$2.39 billion, while EBITDA fell 8.7 percent on-year to S$745 million, Singtel said. In constant currency terms, operating revenue would have risen 7.3 percent on-year, while EBITDA would have fallen 3.5 percent, Singtel said, noting the Australian dollar’s depreciation. The group consumer segment includes the consumer businesses in Singapore and Australia and its investments, which are mainly AIS and Intouch in Thailand, Airtel in India, Africa and Sri Lanka, Globe in the Philippines, and Telkomsel in Indonesia. The Singapore consumer segment saw operating revenue rise 4.8 percent on-year to S$555 million on an increase in equipment sales on launches of higher priced popular handsets during the quarter and amid reduced churn, with 41,000 postpaid mobile customers added in the quarter, Singtel said. But it noted the segment’s EBITDA fell 7.4 percent to S$180 million on a lower contribution from higher margin legacy carriage services and the absence of sublicense revenue for Premier League. In Australia, operating revenue rose 8.0 percent in the quarter to A$1.83 billion, but EBITDA fell 1.8 percent to A$574 million, Singtel said, but added that excluding NBN migration revenue, operating revenue was up 10 percent and EBITDA rose 4.1 percent on postpaid mobile subscriber growth and cost management. The segment added 87,000 postpaid handset customers in the quarter, Singtel said. Operating revenue for the group enterprise segment fell 4.1 percent on-year to S$1.57 billion in the fiscal second quarter, while its EBITDA fell 4.8 percent on-year to S$440 million, Singtel said. “The decline was attributable to lower ICT sales due to the lumpy nature of ICT deals which saw some major project completions last year and continued declines in traditional legacy services, especially voice,” Singtel said. The group enterprise segment provides services including mobile, equipment sales, fixed voice and data, cloud computing for business groups in Singapore, Australia, the U.S., Europe and the region. Operating revenue for the digital life segment rose 12.8 percent on-year to S$313 million in the quarter, while EBITDA losses widened to S$34 million from a S$16 million EBITDA loss in the year-ago quarter, it said. It said revenue was boosted by contributions from Videology, acquired on 22 August, and increases from Amobee, partially offset by a lower media business, but it added that the EBITDA loss was on a one-off adjustment for accrual of stock option expenses and from including Videology’s losses. The digital life group focuses on using the internet tech and assets of Singtel’s operating companies to develop new revenu by entering adjacent businesses, such as digital marketing, regional premium OTT video and analytics. For its outlook, Singtel guided that operating revenue from the core business, comprising the consumer and enterprise groups, would grow by a low single digit for the full year, while EBITDA would remain stable. That was excluding the impact of NBN migration revenue in Australia for the previous and current fiscal years, it said. It said it expected Australia’s mobile services revenue would grow by a low single digit, while Singapore’s would decline by a mid-single digit. This article was originally published on Thursday 8 November 2018 at 7:41 A.M. SGT; it has since been updated.